Wales will secure the Six Nations title and a Grand Slam if they beat Ireland in Cardiff on Saturday. England still have hopes of silverware, but they need to beat Scotland at Twickenham, while also requiring an Ireland victory over Wales. Jones said on Thursday that Wales were "starting to look a bit tired" after making "more tackles than anyone else in the tournament," and were facing an Ireland side "that seems to be peaking at the right time." 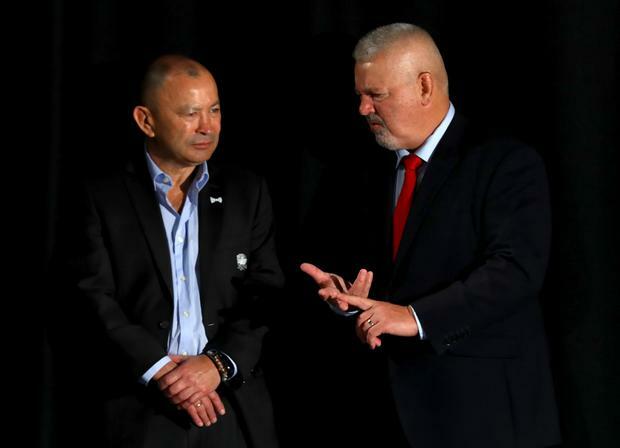 When the Australian's comments were put to him, Wales head coach Gatland, laughing, said: "What the hell is Eddie Jones doing talking about our game? "If it was me, I would be concentrating on playing Scotland. I've got no comment on Eddie Jones talking about us. "If you look at the stats, England have made a hell of a lot more tackles than us in this tournament. My advice to Eddie is to concentrate on the Scotland match." Wales are bidding for a third Grand Slam under Gatland - it would be a record for any Five or Six Nations coach if his players accomplish it - and also leave them in great shape six months before their World Cup challenge in Japan. "I pride myself on the record I've had in big matches when it has really mattered," added Gatland, ahead of his final Six Nations game as Wales head coach before he steps down later this year. "I even get more of a buzz when people write us off, which has happened on a number of occasions before. "It's about building belief and confidence in the players. We've worked in the (Six Nations) down weeks and we've trained as hard as any team I have seen. "We've put that training in the bank, and there is no way anyone is training as hard as us in this Six Nations. "If you want something bad enough and you really believe it can happen, then it often does." Gatland, meanwhile, readily acknowledges Ireland's threat, particularly the one presented by their British and Irish Lions half-backs Johnny Sexton and Conor Murray. "It will be the same approach we had with England," he said. "We put Ben Youngs and Owen Farrell under pressure, and Conor and Johnny are key. "When we've had success against Ireland in the past, we've tried to put pressure on Conor and Johnny and shut their space down. "There is no doubt that when Johnny gets front-foot ball he controls the game exceptionally well. We saw against England that when we did put pressure on Owen, we got some success from that. "It's very much part of the game. You look at opposition 10s and where their strengths are, and you try to negate some of those strengths. "Johnny is world player of the year and absolutely world-class. "We've got to put him under pressure, but in saying that Ireland have world-class players all over the place and they can keep the ball for long phases."